When Gov. Tim Kaine cut the ribbon to open Germanna’s new Stafford Center Wednesday, he said Virginia is rated the state best positioned to rebound from recession in part because of community colleges like GCC. Kaine said he’s counting on GCC and rest of the Virginia Community College System to help the Old Dominion recover from the recession -–and to give its workforce an edge going forward. “Community colleges play an important role, especially in a challenged economy,” Kaine told a crowd at the opening of the Center. He said Virginia has been rated the state best positioned to rebound not just because of a positive business climate, but because of the competitiveness of its workers. And when it comes to companies deciding where to relocate, the quality of Virginia’s workforce is key, Kaine said. The fourth Germanna location--which has four state of the art classrooms, computer labs, and office space--is expected to offer 52 classes this fall and serve approximately 1,000 students. The Center is a partnership between GCC and Stafford Economic Development Authority, which has invested $300,000 over three years to promote economic development through Workforce training. The center will also meet anticipated needs associated with the BRAC expansion at Quantico and the new Stafford Hospital Center. It’s located at Aquia Park, just south of the intersection of U.S. 1 and State Route 610 in North Stafford, which is one of the fastest-growing and congested areas in the region. He said that while areas within commuting distance of Washington like Culpeper and the Fredericksburg area are feeling the impact of the economic downturn, they will be shielded from the worst of it. 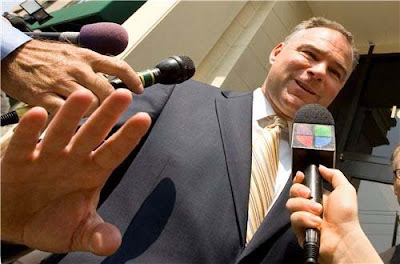 “The world will always beat a path to the broad region that surrounds the nation’s capital,” Kaine said. Germanna has experienced state budget cuts totaling 15 percent, with another soon to come, during a two-year period when it has been the fastest-growing college in Virginia. But GCC President David A. Sam said opening the Stafford Center during lean times signals Germanna’s commitment to help the area bounce back from tough times and help build a new prosperity. Below, Gov. 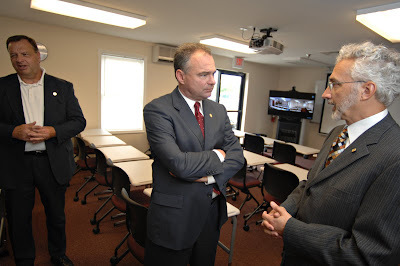 Tim Kaine talks with GCC President David A. Sam before cutting the ribbon to open Germanna's new Stafford Center. Gov. Kaine addresses a crowd of 132 small business owners at Wednesday's Business Sales Growth Seminar at Germanna Community College. The governor and state Secretary of Commerce and Trade Patrick O. Gottschalk both spoke and met with attendees. Gov. 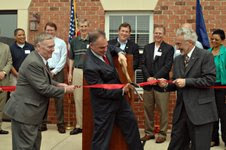 Tim Kaine will cut the ribbon on Germanna Community College’s new Stafford Center at 10:45 a.m. Wednesday, July 29. The fourth location of Germanna Community College—which will have four classrooms, computer labs, and office space—is expected to offer 52 classes this fall and serve approximately 1,000 students. The Center is a partnership between GCC and Stafford Economic Development Authority, which has invested $300,000 over three years to promote economic development through Workforce training. The center will also meet anticipated needs associated with the BRAC expansion at Quantico and the new Stafford Hospital Center. The event is open to the public Wednesday at 10:45 a.m. at Aquia Park, located at 2761 Jefferson Davis Highway (U.S. 1) in North Stafford. VCCS Chancellor Glenn DuBois this week on Fox Business News: "Harvard has been around for 10-plus generations or more. Community Colleges have been around for less than our lifetime. And already we've enrolled half of the nation's undegraduates--here in Virginia we enroll two-thirds of undergraduates. 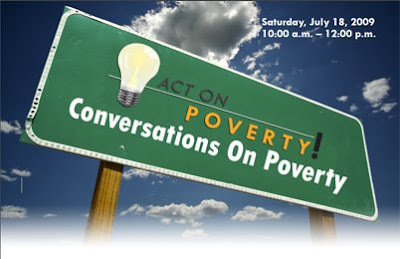 "We've come a long way in a short period of time and I think we're prepared to help more and more Americans..."
Germanna Community College to be site for statewide electronic “Act on Poverty” Town Hall Saturday, July 18 at GCC’s Fredericksburg Campus Germanna Community College will be one of the hosts of a statewide town hall discussion on poverty in Virginia from 10 a.m. to noon on Saturday July 18, providing an unprecedented opportunity for local citizens, groups and organizations to pitch ideas for reducing poverty in their localities and statewide. Participants are encouraged to recommend specific strategies for the Commonwealth’s Poverty Reduction Taskforce and local and state officials to consider. GCC will host the area’s Act on Poverty conversation at its Fredericksburg Campus off U.S. 17 near Cosner’s Corner in Spotsylvania while other Virginia Community College System campuses host talks in their regions of the state. Living in poverty can have negative impacts at any age, including poor nutrition during infancy, increased risk for academic failure in school age children, poor overall health in adults, and decreased access to prescription medication for seniors. Gov. Tim Kaine will speak to participants at each site via YouTube prior to the beginning of the discussion, then suggestions. The statewide town halls will then result in the compilation of a formal list of recommendations for reducing poverty in Virginia, with suggested action steps for local and state implementation. The plan will be presented to this administration and the next, with advance consideration by Virginia's gubernatorial candidates. Current data show approximately 739,000 people, nearly 10 per cent of all Virginians, live below the federal poverty line, including 232,600, or 12 per cent, of Virginia’s children. As of 2007, the federal poverty line was $10,210 in annual income for an individual or $20,650 for a family of four. While Virginia’s statewide poverty rates are among the 10 lowest in the nation, certain regions are affected much more dramatically than others, with Southwest and Southside Virginia each having rates over 17 percent. The governor called current federal guidelines that set the poverty line at $20,650 for a family of four "outdated". The event, to be held in GCC’s Sealy Auditorium, is free and open to the public. No advance registration is required. For directions, go to http://www.germanna.edu/. 2007 Massaponax High grad Rocio Fernandez loves her 2-year-old daughter--and math. The young mom says Germanna's new engineering program partnership with UVa will allow her to take care of her little girl and still pursue her dream career. Germanna plans to offer an associate of science in engineering that will be aligned with the U.Va. program starting this fall. Details are available here on the Web or by calling Mark Gibson, engineering program director, at 540/834-1063 or e-mailing: mgibson@germanna.edu. 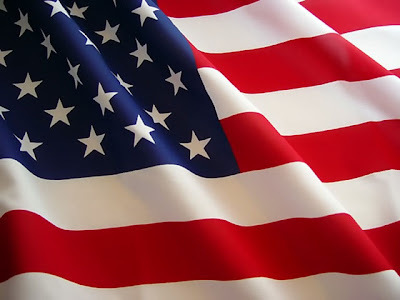 "We hold these truths to be self evident, that all men are created equal, that they are endowed by their Creator with certain unalienable rights, that among these are life, liberty and the pursuit of happiness. That to secure these rights, governments are instituted among men, deriving their just powers from the consent of the governed." With these words, some 56 men chose to set themselves against the greatest military power of their time 233 years ago this month. It is easy for us in our own troubled times to think things are as bad as they can be. Certainly the state of the economy and our risking the lives of some of our best young women and men in two different wars would argue for that. Certainly the arrogance and deceit of a few of our business leaders would argue for that. But consider what it must have been like for those men--and for those women and men who depended on them to make right decisions rightly at the risk of their lives and well-being. Not only were we likely to lose the war, it was considered impossible that if we won we could govern ourselves as a democratic republic across such a huge expanse of geography and with so many people. And there were some fundamental flaws built into our beginnings, including slavery and a basic disagreement about how far individual liberty should be taken at the expense of the common good, and vice versa. On this 233rd anniversary of the signing of the Declaration and the birth of a new nation, let us all draw from their courage and vision to face our challenges and fundamental flaws as a nation and a people.